Reliance Jio Triple Cashback Offer For Jio Prime Members: What You Get On Rs 399 Recharge? Reliance Jio Triple Cashback Offer: How It Works? 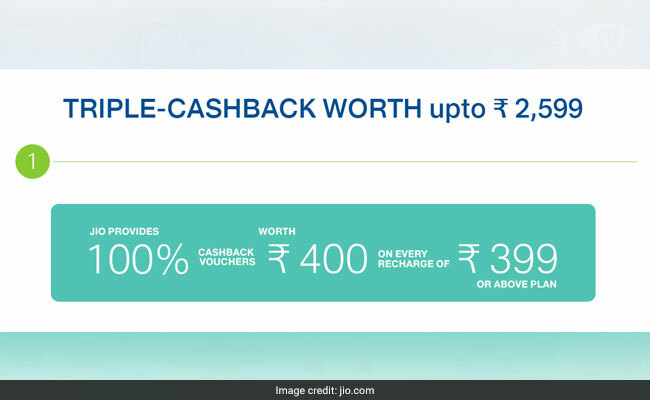 Reliance Jio's 'Triple cashback offer' gives a total cashback up to Rs 2,599 on every recharge of Rs 399 or above. The 'Triple cashback offer' is valid only till December 25, so subscribers must hurry up and avail the benefits at the earliest. Reliance Jio's 'Triple cashback offer' was launched on November 10 and is valid only for Reliance Jio Prime members. Earlier, Reliance Jio's cashback offer was supposed to end on November 25, but, Jio extended the offer till December 15. Jio once again extended its cashback offer, and it now ends on December 25. What is Jio's Triple Cashback Offer? According to the website of Jio (jio.com), Jio Prime members can avail triple cashback of up to Rs 2,599 on every recharge of Rs 399 or above. 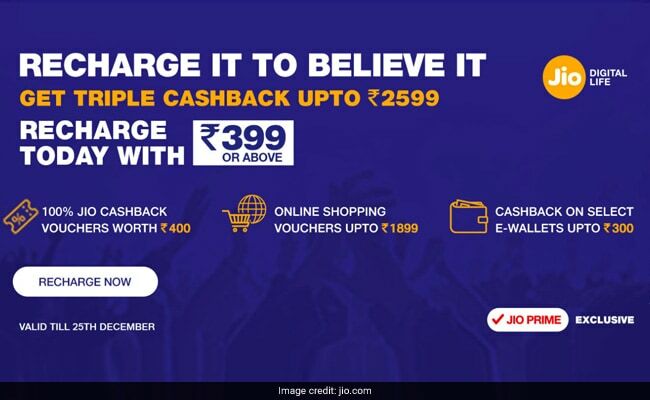 There are three ways to avail the Jio triple cashback offer- Jio tariff plan recharge, recharge through digital wallets and vouchers on shopping from Jio's e-commerce partners. Jio is offering 100 percent cashback vouchers worth Rs 400 in the form of eight vouchers of Rs 50 on every recharge. Jio has partnered with leading digital wallets to bring instant cashback of up to Rs 300. Jio has also partnered with e-commerce players to offer vouchers of up to Rs 1,899 on every recharge. This raises the total value of the offer to Rs 2599 (Rs 400+Rs 300+Rs 1,899). Under this offer, Jio Prime members get Rs 400 cashback in the form of eight vouchers of Rs 50 denomination. This will be credited immediately in customer's account and will be visible under My Vouchers in MyJio app. Jio has partnered with leading digital wallets to bring instant cashback of up to Rs 300. The cashback from these wallets will be instant during recharge. Users will get up to Rs 300 while paying for the recharge using the company's select partner wallets like Mobikwik, PayTM, Amazon Pay, and PhonePe. When the recharge is done through Amazon Pay, users get Rs 50 cashback (both new and existing Jio users). Paytm is offering Rs 15 cashback to both new and existing customers. 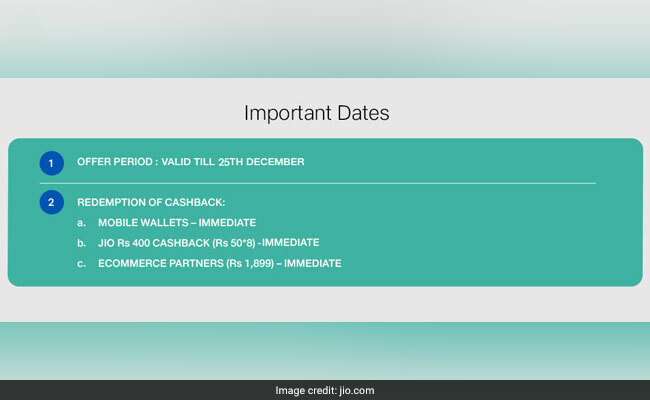 MobiKwik offers a cashback of Rs 300 to new Jio Prime members while Rs 149 to existing ones. 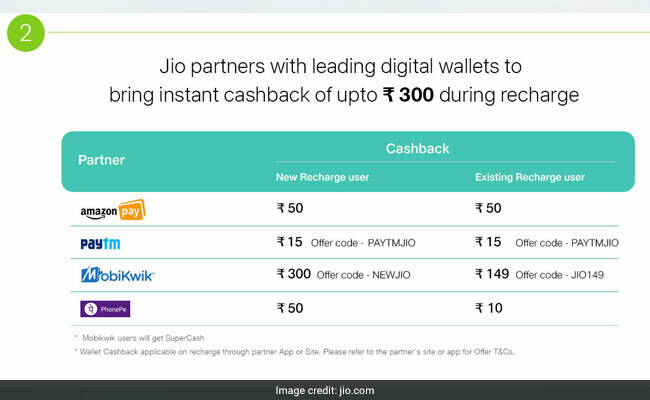 PhonePe wallet is also offering cashback where new Jio users get Rs 50 while existing ones get Rs. 10. Jio has partnered with e-commerce players like Yatra, AJIO and Reliance Trends to offer vouchers of up to Rs 1,899 on every recharge. These vouchers will be visible under My Coupons in MyJio app. 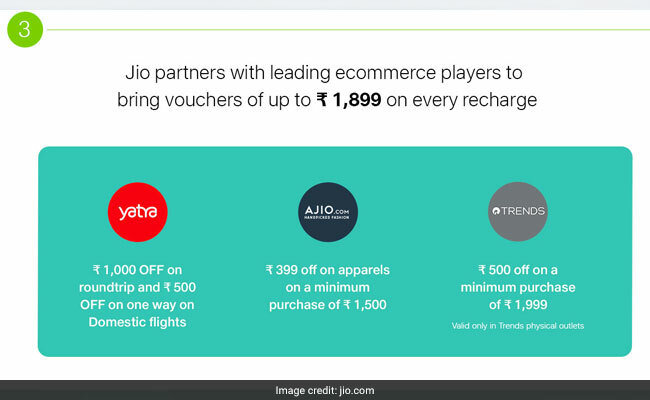 Jio Prime members can get Rs 399 discount on transactions worth Rs 1,500 and above on AJio.com, Rs 500 instant discount on purchases of Rs 1,999 and above on Reliancetrends.com and Rs 1,000 discount on round trip on domestic flights and Rs 500 on a one-way ticket on Yatra. Reliance Jio's Rs. 399 prepaid recharge plan comes with a validity of 70 days. According to Jio's website, Rs. 399 prepaid recharge plan also offers 70GB of high speed data with a daily limit of 1GB. The data speed is reduced to 64 Kbps after a customer exhausts the daily 4G data limit. This offer is valid for Reliance Jio Prime members only. Apart from this, Reliance Jio's Rs 399 prepaid recharge plan also gives unlimited local and STD calls, unlimited SMSes, free national roaming and access to a host of Jio apps.